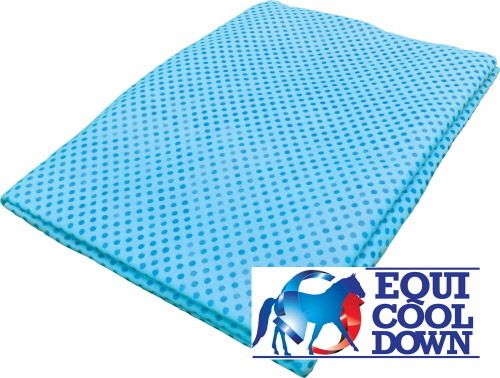 An astonishing 60” wide x 63” long w/ Adjustable Spandex Chest and Leg Straps , this very FIRST OF ITS KIND Equi Cool Down Equine Body Wrap takes all the attributes of our Equi Cool Down towels and presents them in Equine form. Our 2-step process begins when water of any kind gets absorbed by the multi-fiber weave. Next a plant extract actually makes the retained moisture cold when simply waved. These special cooling wraps can stay cool for hours simply by resetting using a mist-setting on a hose or by using a spray bottle any available water source and either walking your horse or lightly flapping sides of wrap to activate. 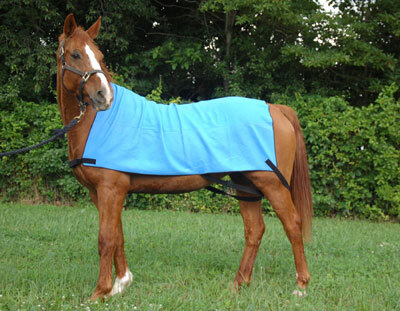 When activated, wrap will drop from 16 to 22-degrees cooler than outside temperature to help cool your horse’s muscles slowly without allowing the horse to catch a chill. NO REFRIGERATION is EVER needed.